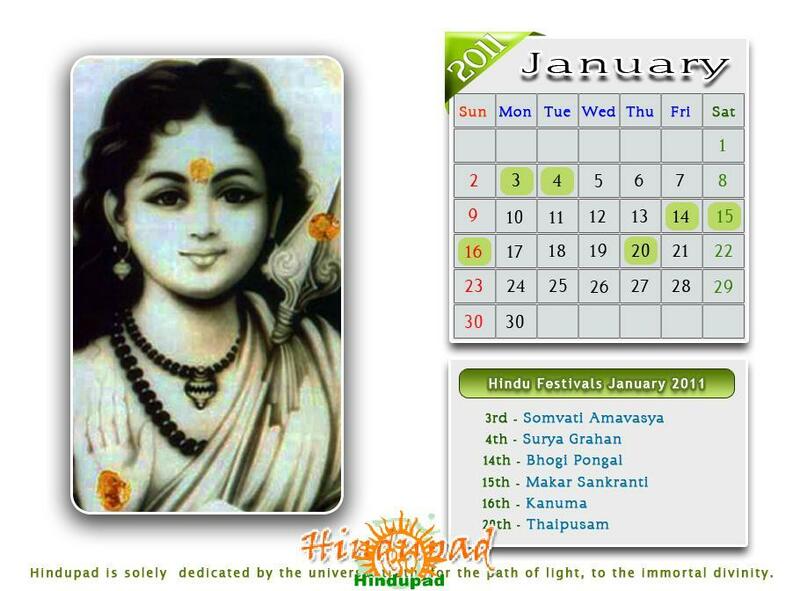 Hindu calendar January 2011 or free Hindu desktop calendar wallpaper for January 2011 is here to download. Apart from Makar Sankranti or Pongal, Thai Pusam is the biggest festival in January 2011; the wallpaper is designed with the image of Lord Subramanya (Lord Skanda or Murugan). The list of important festivals in January 2011 is also included in the desktop wallpaper. Some of the other important festivals in January 2011 are – Sabarimala Ayyappa Makaravilakku or Makara Jyothi, and Magh Bihu in Assam, Shakambari Devi Navaratri. January 2011 coincide with Margashirsha month and Poush month in Marathi, Gujarati, Kannada, Telugu, and Goa calendars. It is Poush mahina and Magh mahina in North Indian Hindi calendars. Here you can read the list of other important festivals and auspicious days in January 2011. Click here to get the daily Panchangam (Daily astrology) details of January 2011.